The Deming of America provides an overview of Dr. Deming's theory of management and was first seen on public television stations across the nation. The program shows Deming the man, focuses on his ideas, makes his message easy to understand, and shows how corporate and military leaders are using his concepts. Most people, after viewing the video, know that Dr. Deming's message is valid -- not because of how persuasive he is -- but because his message makes so much sense and, once understood, seems intuitive. The Deming of America video program is the result of more than two years of effort by Priscilla Petty and her organization. Prior to meeting Dr. Deming, Ms. Petty had written a weekly syndicated newspaper column focusing on management techniques and improving personal effectiveness at work for about ten years. The Vice Chairman of Procter and Gamble insisted that Ms. Petty meet Dr. Deming because of the impact Dr. Deming had had on his company and arranged for the meeting. Shortly thereafter, Ms. Petty met with Dr. Deming in his Washington home, accompanied and introduced by Procter and Gamble's Director of Quality. Ms. Petty immediately recognized the profound importance of Dr. Deming's message and accepted Dr. Deming's invitation to remain in Washington at his home and accompany him to New York in a few days while he consulted with companies, taught his course at NYC and lectured at Columbia. Ms. 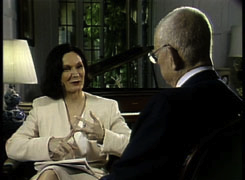 Petty's vision for the public television special gradually evolved over the next several months as she accompanied Dr. Deming on numerous business consulting trips and to his four day seminars. She not only saw his genius at work as he privately consulted with numerous corporate leaders and during the seminars, she had countless hours of private discussions about his theories and philosophies. She was continually asking questions and listening, learning, while they traveled on planes, ate meals, and at the end of each day. After about eight months, Ms. Petty shared her vision with Dr. Deming and he agreed to cooperate. Then the work began.